When my husband Ralph and I are at the beach, we make a point of getting up early to see the sunrise over the ocean. If we time it right, we’re rewarded with magnificent skyscapes. Even before the sun peeks over the horizon, the sky lights up with a blush of readiness. But that glow of anticipation is brief, soon replaced by blazing light from a fiery orb. Quickly - surprisingly quickly - nature’s powerball fills the sky. The sun rises with earnest intent. The sky brightens. A new day begins. I never tire of watching the early morning sky. Looking up. Looking around. Listening to waves crash against the shore. Gulls crying. Birds flying. Light changing along with the clouds. Sunrise over the ocean is as special as it is ordinary, an everyday occurrence of ever-changing proportions. Ralph and I just returned from another early morning beach time. Although we arrived with several minutes to spare before the sun actually rose, the golden orb never appeared. Of course it was there, but a shroud of low-lying clouds kept it covered, hidden from sight. Nonetheless, the sky was spectacular. Innumerable shades of beige, blue and gray reflected on wild waves splashing ashore. A storm was brewing and while hints of light slipped through slivers of pillowy fluff, the full force of sunlight failed to appear while we were there. My husband, who grew up swimming in the cold water of Nauset Beach on Cape Cod, eagerly entered the pounding surf. 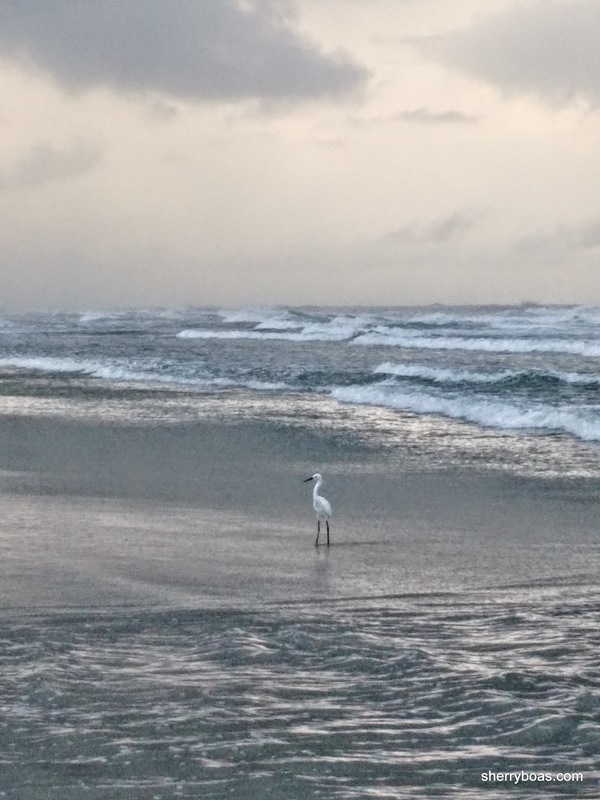 At 82-degrees, the water at New Smyrna Beach is a welcome change from the chilly ocean dips of his youth. 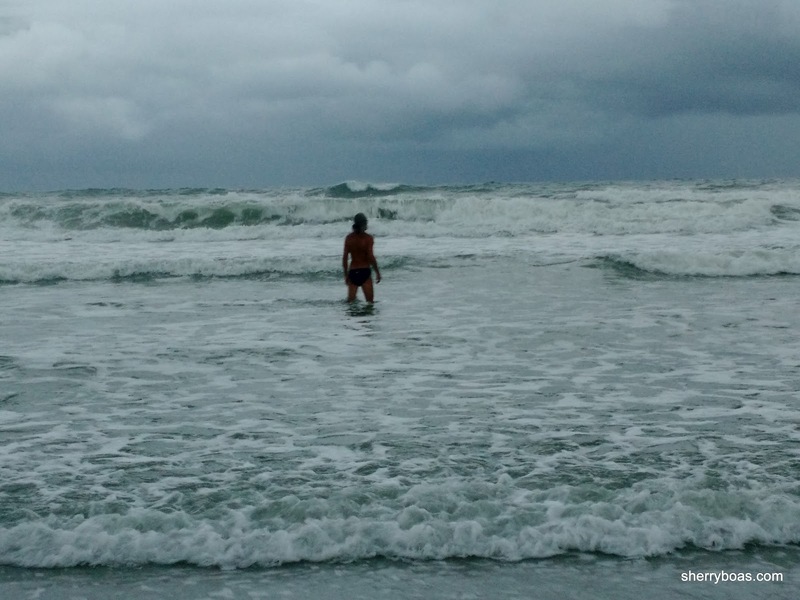 While Ralph played in the pummeling waves, I remained securely ashore, my eyes focused on the surrounding sights. 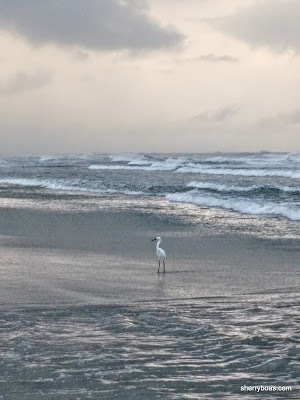 A snowy egret foraged for food. A pod of pelicans flew overhead. Gulls faced windward on a sargassum-dotted beach while short-legged sanderlings scurried by. As Ralph caught one wave after another, i watched clouds shift and the changing color of the sky. 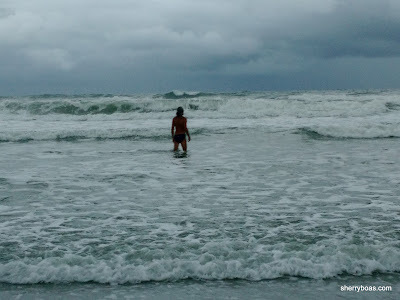 As I walked along the shoreline, I realized how seldom I think of going to the beach during inclement weather. On rainy days, when storm clouds gather or when the sky is less than sunny, I tend to stay home or do errands in town. I don’t think of going to the beach, but maybe I should. 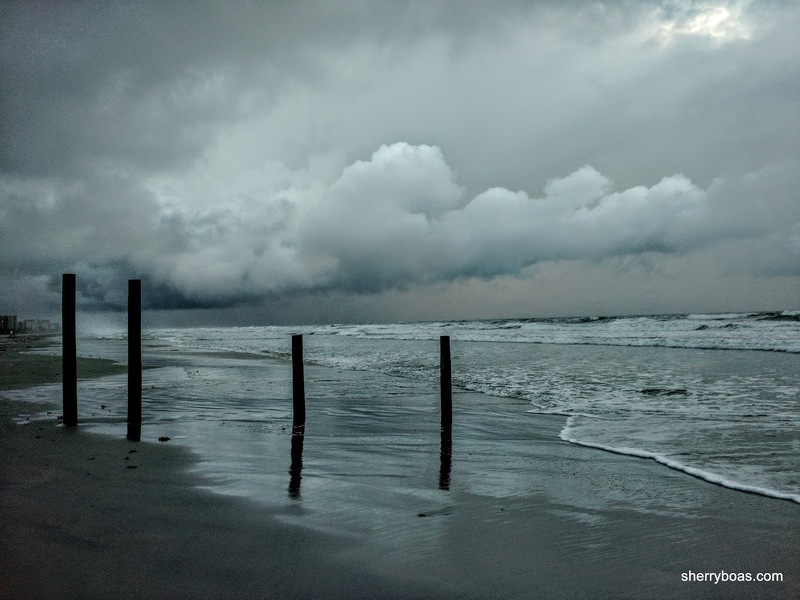 The ocean is wild when the sky is heavy with impending weather. People are few. Waves are many. Even without blaring light, the sky provides an amazing show. There are those who say that spending time at the ocean rejuvenates the spirit. For some it’s their ‘happy place,’ a touchstone to reality. To me, the beach is simply another wondrous world to explore. It’s a roaring lesson of power and patience. Timeless beauty. Undefeatable energy. Even when a sunrise hides behind a shroud of clouds, it’s a place worth being. Beautiful video..thank you for this! You're most welcome, Trish! I hope you'll visit often. You can also click on the 'subscribe' link to receive new posts in your inbox when they're posted.